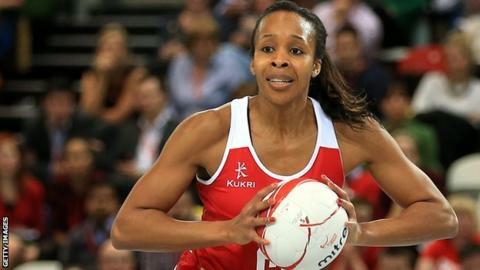 Captain Pamela Cookey says it will be an "amazing honour" to receive her 100th England cap during the three-Test series against Trinidad and Tobago. The former Team Bath player will join a select group to have made 100 appearances for England, with Kendra Slawinski (128) the record holder. Cookey spent six months on the sidelines with an Achilles injury last season, causing her to miss last summer's Commonwealth Games in Glasgow, where England failed to win a medal. Anna Mayes has since left her post as England head coach, with former player Tracey Neville replacing her on an interim basis. Neville will lead the team for the first time in the forthcoming series - the final warm-up games before this summer's World Cup in Australia. England are ranked third in the world and Trinidad and Tobago ninth. Cookey said Neville - the sister of former footballers Gary and Phil - is "very dedicated and committed" and "takes no-nonsense". She added: "We need to step up and work for Tracey. It's always tough against international opposition so it will mean a lot for us to win this series. "It will put us in good stead when we head off to Australia. We'll be in a fighting position ready to take on the world's best."